Posted in: vertigo. Tagged: 1-75, cards, complete, master, novels, partial, posters, sandman, vertigo. For Sale is a huge collection of DC Vertigo The Sandman & Sandman Related Comic Books, Graphic Novels, Books, Trading Cards, Posters. Aside from the complete set run of 1-75 this lot also includes an additional 68 Comic Books & Graphic Novels. The following is a list of what is included. 1991 The Sandman Orpheus Special #1 Comic. 1993 Death the High Cost of Living 3 Comic Set Plus additional #1 issue. 1993 Sandman Mystery Theatre #1 Comic x2 Copies. 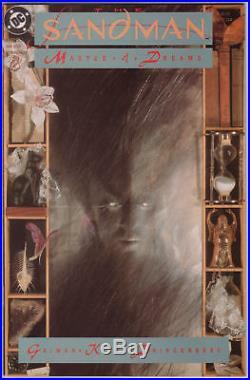 1993 The Sandman #50 Platinum Variant Comic. 1994 Sandman Gallery Of Dreams #1 Comic. 1994 Death Talks About Life Comic. 1994 Death Gallery #1 Comic. 1996 The Sandman Preludes & Nocturnes #1 Comic. 1996 Death The Time Of Your Live 3 Comic Set. 2001 The Sandman Presents #1 Everything You Always Wanted To Know About Dreams Comic. Additional DC Vertigo Sandman & Similar Comics. 1990 The Books Of Magic 4 Comic Set. 1993 The Children’s Crusade 2 Comic Set. 1993 Black Orchid Comic x2 Copies. 1993 The Children’s Crusade Black Orchid Comic. 1994 The Books Of Magic #1, #2, #3, #4 Comics. 1995 Endless Gallery #1. 1995 Dreams & Nightmares #1. 1996 The Dreaming #1 Comic. 1996 House Of Secrets #1 Comic. 1997 Destiny A Chronicle of Deaths Foretold 3 Comic Set. 1998 The Girl Who Would Be Death 4 Comic Set. 1998 The Dreaming Special #1. 2000 Winter’s Edge Holiday Special #3. 2001 The Little Endless Storybook Comic. Sandman Books & Graphic Novels. 1991 The World Of The Sandman 3 Graphic Novel Set w/ Sliding Book Case. 1992 The Sandman Season Of Mists Hardcover Book No Dust Jacket. 1993 The Sandman Fables and Reflections Hardcover Book w/ Dust Jacket. 1993 The Sandman A Game Of You Hardcover Book w/ Dust Jacket. 1994 The Sandman Brief Lives Hardcover Book w/ Dust Jacket. 1994 The Sandman Worlds End Hardcover Book w/ Dust Jacket. 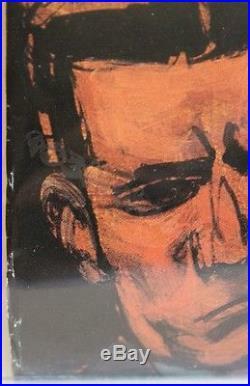 1994 Death The High Cost Of Living Graphic Novel. 1995 The Sandman Dream Country Hardcover Book w/ Dust Jacket. 1995 The Sandman Preludes And Nocturnes Hardcover Book w/ Dust Jacket. 1995 The Sandman The Doll’s House Hardcover Book w/ Dust Jacket. 1996 The Sandman The Kindly Ones Hardcover Book w/ Dust Jacket. 1996 The Sandman Book Of Dreams Hardcover Softcover Book. 1997 The Sandman The Wake Hardcover Book No Dust Jacket. 1997 Death The Time Of Your Life Hardcover Book w/ Dust Jacket. 1997 Destiny A Chronicle Of Deaths Foretold Graphic Novel. 1999 The Sandman Companion Hardcover Book w/ Dust Jacket. 1999 Veils Hardcover Book w/ Dust Jacket. 1999 The Sandman The Dream Hunters Hardcover Book No Dust Jacket. 2000 The Quotable Sandman Hardcover Book w/ Dust Jacket. 2002 Murder Mysteries Hardcover Book NO Dust Jacket. 2003 The Sandman Endless Nights Hardcover Book w/ Dust Jacket. (I believe the books listed about with no dust jackets did not originally come with one but I could be wrong on a few). 1994 Skybox Vertigo Trading Cards Complete 90 Card Set w/ 6 Card Foil Bonus Set & 1 Death Skydisc Card. Cards come with accompanying 1994 Skybox Vertigo Binder w/ Pages. 1994 Skybox Vertigo The Sandman Trading Cards Two Complete 90 Card Sets w/ Morpheus Hologram Insert, Insert Set CI-1 – CI-9, The Doll’s House Insert S1 x2, Guardians of The Gate Wrong Back Error, several additional cards. 1994 Skybox Vertigo The Doll’s House Oversized Promo Card. 1994 Skybox Vertigo The Sandman Trading Card 3 Page Press Release in Folder with Unopened Pack and 2 Posters. 1993 The Sandman Morpheus & Death Large Size Poster. 1997 Destiny A Chronicle Of Deaths Foretold Large Size Poster. 1999 The Sandman The Dream Hunters Large Size Poster. All of these items appear to be in great shape. There are some items with minor flaws but no major problems. Some of the key comics look to be worthy of sending in for grading. Photos will be added soon. Reasonable offers will be consider. The item “DC Vertigo Sandman Partial Master Set Complete Run 1-75 + Novels, Posters, Cards” is in sale since Friday, March 16, 2018. 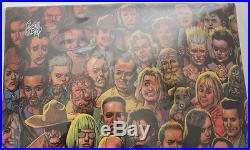 This item is in the category “Collectibles\Comics\Modern Age (1992-Now)\Superhero\Sandman”. 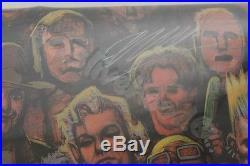 The seller is “eddieplank” and is located in Delray Beach, Florida. This item can be shipped to United States. Posted in: vertigo. 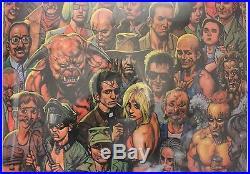 Tagged: comics, double, ennis, fabry, poster, preacher, rare, signed, vertigo. 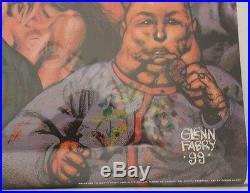 DC COMICS 2000 PREACHER GLENN FABRY POSTER DOUBLE SIGNED. ANY IMPERFECTONS WILL BE PROVIDED IN DESCRIPTION BELOW. FOR VINTAGE POSTERS, THEY ARE ORIGINALLY STORED ROLLED AND ARE HANDLED WITH EXTREME CARE DURING CATALOGING. VINTAGE/OUT OF PRINT (OOP): YES, OUT OF PRINT 16 YEARS. SIGNED: YES, PREACHER CREATOR & WRITER GARTH ENNIS SIGNED AT TORONTO FANEXPO 2013 AND GLENN FABRY SIGNED AT OTTAWA COMICCON 2014. DIMENSIONS: 22″ x 34″. ADDITIONAL INFORMATION: THIS FEATURES THE EXACT SAME PREACHER #55 COVER ART OF THE MAIN AND SUPPORTING CAST OF THE CULT FAN FAVORITE SERIES. GET READY FOR THE HIGHLY ANTICIPATED AMC TV ADAPTATION PREMIERING ON MAY 22, 2016! A FEW LITTLE EDGE CRINKLES ON THE LOWER LEFT. OVERALL IN FANTASTIC SHAPE! PLEASE REFER TO PICTURES PROVIDED. ATTENTION COMIC POSTER FANS! I WILL BE LISTING A LOT OF VINTAGE POSTERS SIGNED/UNSIGNED/OOP/CURRENT! THERE ARE ALSO PRINTS/LITHOS TOO! COME CHECK IT OUT! SO DON’T WAIT, MAKE HASTE! 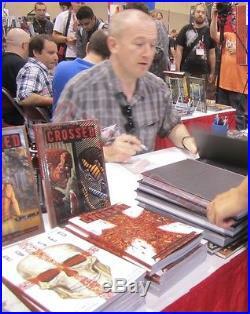 ALSO CHECK OUT MY MANY NEW/OLD SIGNED OR OUT OF PRINT (OOP) TPB’S HARDCOVERS AND POSTERS LISTED! THERE’S SOMETHING FOR EVERYONE! HOW THESE POSTERS ARE KEPT: BACK IN THE EARLY 80’S AND 90’S THERE WAS NO METHOD AVAILABLE THAT I COULD FIND TO PRESENT MY POSTERS WITHOUT HANGING ONTO MY WALLS TO ADMIRE. MY ONLY OPTION WAS TO KEEP THEM ROLLED AND STORED IN A BOX. IT WASN’T UNTIL AROUND 1998 THAT I STARTED TO ORDER POSTER SLEEVES TO BOTH PRESERVE AND BE ABLE TO ADMIRE MY FAVORITE CHARACTERS OR ARTISTS. SIMPLY PUT, THEY’RE LIKE HUGE COOL ART ON YOUR WALL. BUT THE FACT IS THEY MAY WELL BE AS RARE AS COMIC BOOKS SINCE THEY’RE SPECIAL NOVELTY ITEMS AND THEIR PRODUCTION RUN IS MUCH SMALLER. THEY WERE MOST LIKELY POPULAR DURING 1980’S, BUT AS TIME PROGRESSED, COLLECTING BOOKS WAS THE WAY TO GO. POSTERS WERE PUT TO THE SIDELINES AS TOYS, T-SHIRTS, STATUES AND GRAPHIC NOVELS BECAME MORE ABUNDANT, LESS MAINTENANCE AND APPEALING. THE GOOD NEWS NOW, WITH BEING A COMIC COLLECTOR IT’S NOT EXCLUSIVE TO NERDS ANYMORE. WITH THE MEGA POPULARITY OF COMICS IN THE MEDIA MAINSTREAM, IT’S AN OPEN MARKET TO CATER COLLECTORS, AND HOPEFULLY I HAVE WHAT THEY NEED :D. IF INTERESTED, CHECK OUT MY OTHER LOTS, HARD TO FIND OUT OF PRINT OMNIBUSES & TPB & HC BY CLICKING MY OTHER ITEMS LINK! I DO NOT USE STOCK PHOTO’S. I MAY HAVE NUMEROUS SIMILAR ITEMS FOR SALE INDIVIDUALLY OR IN LOTS. IM NOT A PROFESSIONAL GRADER, BUT AS A COLLECTOR I TRY TO ACQUIRE THE BEST OF THE BUNCH. IF REQUESTING PICTURES OF CERTAIN ITEM OF INTEREST, I WILL GLADLY SEND ADDITIONAL PICTURES. ALL SOFTCOVER TPBS AND UNSEALED HARDCOVERS WILL BE BAGGED. IM AN AVID 20+ YEARS COMIC COLLECTOR STRICTLY POSTERS/PRINTS, COLLECTED EDITIONS SUCH AS TRADE PAPERBACK, HARDCOVERS OR OMNIBUSES. I M ALSO AN EXPERIENCE PACKAGER AND WILL ENSURE YOUR ITEM ARRIVES TO YOU EXACTLY THE WAY I HAVE ADVERTISED ON THIS LISTING. I RESIDE IN A NON SMOKE, PET FREE HOME. I STORE MY BOOKS IN AN ENVIRONMENT CONTROLLED AREA AWAY FROM DIRECT SUNLIGHT & DAMPNESS. MAJORITY OF BOOKS ARE BAGGED. POSTERS ARE KEPT ROLLED, BUT WITH VINTAGE POSTERS, IT’S BEST KEPT IN A POSTER SLEEVE AND SECURELY STORED. I HANDLE ALL MY ITEMS WITH EXTREME CARE. 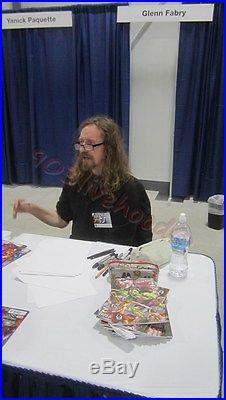 I ALSO ATTEND CONVENTIONS AND ALL AUTOGRAPHED MERCHANDISE BY WRITERS, ARTISTS, MISC GUESTS ARE AUTHENTIC. HAVING HARDCOVERS SIGNED, THE DUSTJACKETS I NEVER BRING TO BE SIGNED. THEY ARE CAREFULLY REMOVED, STORED AND CAREFULLY REPLACED. ALL SALES ARE FINAL! COMIC GRADING VARIES FROM DIFFERING PERCEPTIONS. SINCE GRADING FOR COMICS, BOOKS, POSTERS/LITHOS IS HIGHLY SUBJECTIVE, I DO MY BEST WITH PICTURES AND ACCURATELY DOCUMENT FLAWS. I WILL ACCOMMODATE AS BEST AND SOON I CAN. 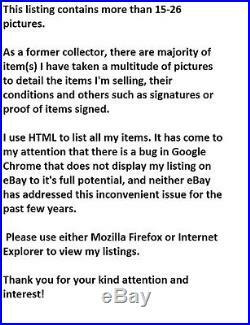 MUCH OBLIGED FOR YOUR KIND ATTENTION AND INTEREST FOR MY ITEM! MAJORITY OF MY MANY BOOKS ARE STORE-BOUGHT/SPECIAL ORDERED AND CHARGED HST (13%). Please refer to detailed photos to make your own grading assessment. I will tell you if the item is untested, not working, any flaws at all, and I provide as many pictures as I feel will adequately do the product justice. I WILL HOWEVER WILL MORE THAN HAPPY TO DECLARE THE ITEM AS GIFT IF REQUESTED. INTERNATIONAL BUYERS FROM U. 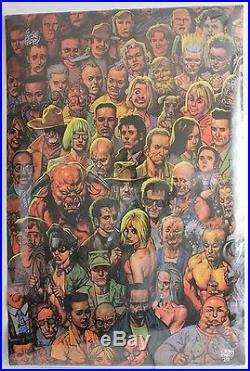 The item “DC VERTIGO COMICS PREACHER DOUBLE SIGNED FABRY ENNIS POSTER 22 x 34 RARE OOP” is in sale since Monday, October 17, 2016. This item is in the category “Collectibles\Comics\Posters”. The seller is “903livehood” and is located in Unionville. This item can be shipped worldwide.